I always try to come up with new toppings for my party standard of crostini. My inspiration usually comes from food combinations I enjoy for dinner. In this case the inspiration came from my fallback entertaining option of 4 hour roasted pork shoulder, crusted in fennel seeds which I serve with a citrus fennel salad. The pork recipe came from Jamie Oliver‘s ‘Jamie’s Italy’ book. Probably my most-used cookbook. I could go on all day about my love for Mr Oliver but as much as I love all his books (and I do have them all), this is the one I return to time and time again. I like to cook a decent size piece of pork so that it doesn’t dry out as a smaller piece might. It’s also a pretty inexpensive cut of meat so I figure I might as well cook a load of it and only have one lot of washing up. My kids love it so I freeze individual batches of the cooked and shredded meat ready to add to pasta for their dinners. Depending on how many crostini you make you will have leftover pork. No hardship. Stir it through some pasta the next day, keep it for sandwiches or tacos or have it with cauliflower or celeriac mash and veggies for dinner. The pork really does need some acid to off-set the richness. Be generous with your squeeze of lemon just before you serve. I sliced my baguette and froze it at the start of the week when I got home from the shops. Then I pulled it out of the freezer and onto trays on the morning of the party to defrost. I cooked it on a cookie sheet at around 400F/200C for 10 minutes or until slightly golden. The fennel salad was also made a few hours before the party. 3. Roll the pork in the pan so that is covered on all sides with the spices. 4. Put the lid on and put the pan into the oven for around 4 hours. No need to do anything during that time and if it cooks a little longer it won’t be a problem. 1. Use a knife or the slicer on a standard box grater to get very thin slices of fennel. Be sure to keep the green fronds too as they are not only beautiful but delicious. 2. Stir the shredded fennel together with the lemon juice and zest and add salt and pepper or chili flakes to taste. Toast the slices of bread (see prep ahead instructions). Then warm the pork if you make it ahead of time. I usually warm it in the oven (150F or 300C) in the pan I cooked it in with the lid on until piping hot. Drizzle a little olive oil over the whole tray of bread then place a spoonful of the pork mixture on top of the bread and push it down so it sticks. Then use your fingers to pinch a small amount of the fennel salad on top of the pork. I like to sprinkle the fennel fronds, a squeeze of lemon juice, freshly ground black pepper, sea salt and a grating of lemon zest over the finished platter of crostini just before serving. Serve warm. 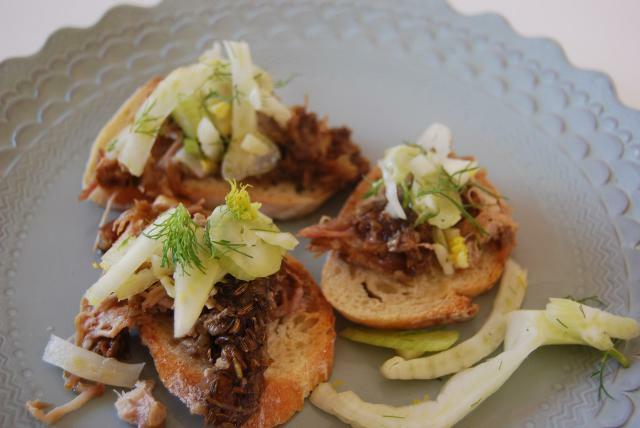 Find more recipes for pork, fennel and canapés here.